Pudlas, pudas, chilas is basically several names for a very healthy simple snack. Very popular in most gujarati families as a quick snack. 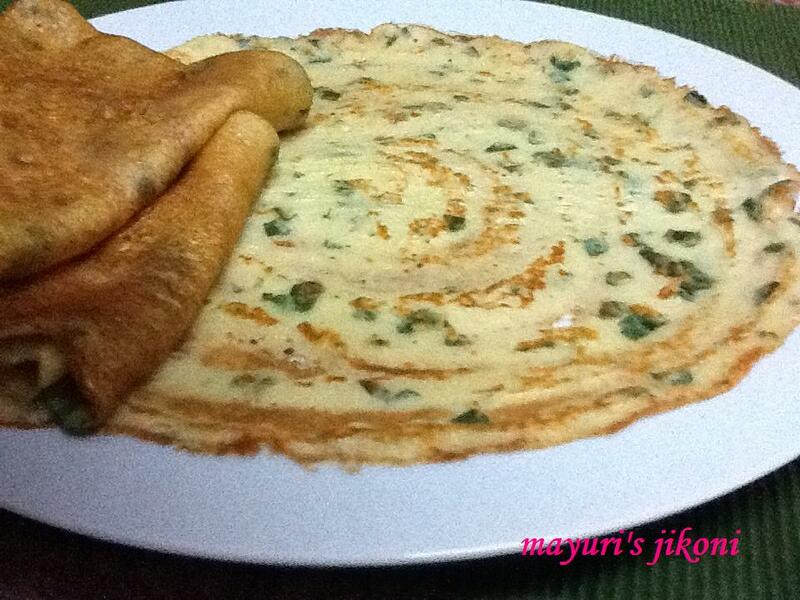 Its so similar to the dosas of the south but without the sambhar and vegetable or to the french crepe but full of spices. I prefer to use the non stick tawa to avoid any messy, sticky pudlas etc. Serve them hot as cold ones don’t taste that great. Serve with pickles, chutneys or if my cousins from Harrow were coming down all they would need is a huge bottle of Heinz ketchup. Kids love pudlas. Mine use to have them with ketchup and I could easily sneak in the fenugreek or spinach without them knowing. What is the green stuff and I would so innocently reply “dhania beta dhania”. Oops now the secret is out. The absolute quick version is to just make a batter with chickpea flour (chana flour, besan) but I prefer the moong dal ones as they turn out crispy and taste different. Soak both the lentils together in warm water for 2 hours. Drain out the water and wash the lentils. Put the lentils in a liquidizing jug. Add the onion and garlic to it. Using about a cup of water, liquidize the lentils to a fine paste. Take the paste out into a bowl. Add the rest of the ingredients except the baking soda and oil. Mix very well. Let the batter rest for 1 hour. Heat the frying pan or tawa over medium heat. Rub a little oil onto it using a kitchen towel. Pour about a ladleful (approximately ¼ cup) of the batter onto the tawa and spread it out into a circle about 7 to 8 inches using the ladle or a small steel bowl. The trick is to start moving the ladle or bowl from the centre in a circular motion slowly moving towards the rim of the pan. Any large holes may be filled with a bit more of the batter. Pour a teaspoonful of oil around it. Let the pudla cook till it becomes light golden. Take a spatula or flat spoon and lift it from the edges and flip it over. Add a bit of oil all around it and let it cook for 2 to 3 minutes. Repeat steps 10 to 11 with remaining batter. Add 1 cup of chopped spinach to the lentils before liquidizing it. The pudlas will be green. Add chopped fresh coriander instead of fenugreek. Add 1 egg if you like. If you do then the amount of liquid required for grinding will be reduced. Use moong dal with the skin instead of the yellow one. If the batter does not spread easily, add a bit more water. Make smaller pudas if you cannot make a big one. The thickness of the puda depends on how fast you are able to spread the batter.